On April 20th, 2010, the U.S. Department of Defense, Joint Forces Command released their annual major policy report, the Joint Operating Environment or “JOE Report“, signed by General James Mattis of the Marines. A significant message within the report is that within two years, “surplus oil production capacity could entirely disappear” and that by 2015 there could be serious shortages. The same week, the International Energy Agency announced that oil consumption in 2010 will be a record 86.6 million barrels a day and that the worldwide economic recovery was threatened by “the potential of supply falling short of demand.” One month ago, an Oxford University report argued that conventional oil reserves are overestimated by several hundred billion barrels and that demand may outpace supply within four years. Two months ago, Sir Richard Branson, the billionaire Founder of the Virgin conglomerate, told an international conference that the oil crunch would come in five years. Another report, based on petroleum industry data, says we probably have until 2022. Somewhere in there is the truth, but one should note that the longest projection is only 11 years out. Change is coming, and it is coming soon. The chart above shows a future of demand outpacing supply beginning in 2012. America uses 21 million barrels of oil a day. Even if President Obama’s plan to open several gigantic off-shore areas to drilling pans out in full, it will only satisfy 10 percent of this country’s current oil needs, and not earlier than 2020. Many of the US Navy’s carrier-based fighter planes already run on 50/50 biofuel blends. The Navy plans to run all ships, planes and vehicles on 50 percent alternative fuels by the end of this decade. The Army’s new combat vehicles will run on biodiesel and ethanol. The Department of Defense budget includes $2.7 billion to improve energy efficiency, and not because it looks good in a brochure, but as a matter of national security. As politicians blather on, people who can’t take chances are taking action. The planet is not running out of oil, but in less than a decade it will be too expensive and difficult to extract to be simply burned in private vehicles. America’s suburban economy is built on the premise of cheap energy. At $5 a gallon or so, even the big box store economic model breaks down. The J.O.E. Report also suggests that Western Africa is shaping up as the potential starting point for World War III as the major powers jockey for position and access to the low-sulfur, “light sweet” oil that is easier to process than Arabian oil. Africa contains only 10 percent of the planet’s proven oil reserves and now with a population of over 1 billion, Africa will need all this oil for her own needs. Home grown biofuels will reduce dependency on both foreign petroleum and foreign biofuels, but their return of useful energy is not as efficient as petroleum to support the society we’ve built. Hundreds of organizations are embracing and investing in jatropha orchards while others work out the challenges of micro algae. Still others are hoping the mineral reserve reports are grossly inaccurate and there are enough minerals to make tens of billions of EV vehicle batteries and electric motors over the coming decades. It took 150 million years for the earth to “brew” petroleum from micro algae and we will have used it up in 150 years. There are estimates from respected sources that in as little as 50 years we will have used up much of the earth’s mineral reserves in the production of EV’s and hybrids. 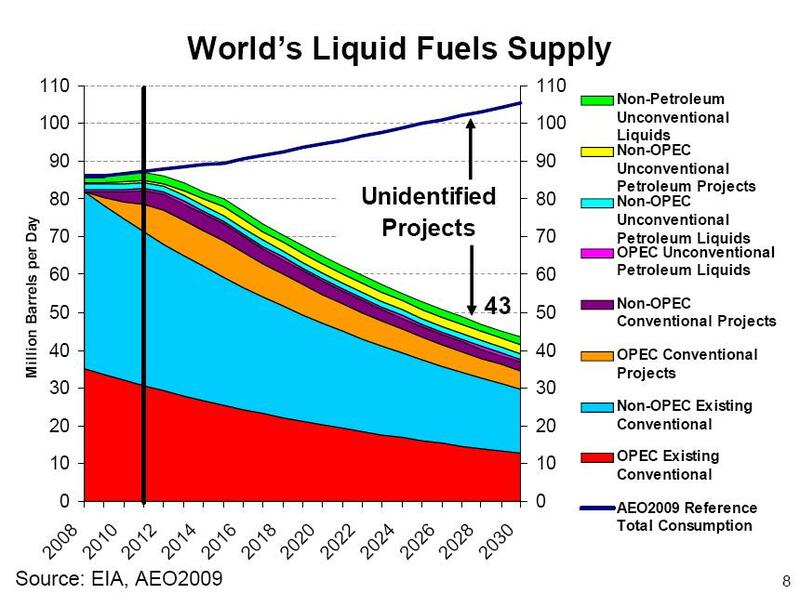 We need to go far beyond the concept of Peak Oil and consider “Peak Everything“. If it is not sustainable, it is not Green and no battery technology is 100% recyclable. We need to add a line item in the EV manufacturing business plans to “Mine the minerals of Mars”. The Germans decided 20 years ago that they would design and implement a sustainable economy that can work in this century. They’ve built a significant “green” energy sector and have already cut carbon emissions by 20%. Germany’s solar panel incentive program has been so successful that they may scale it back because of a glut of electrical power. Which country is better prepared to face what is coming? Americans are teaching their children that if they bring the plastic bags back to the supermarket and take slightly shorter showers, we’re all green and it will all work out. Someone will invent something. Many politicians cheerlead for powerful interests, instructing us that any modification in how we move, work, play or eat is some kind of massive defeat for America. Michael Miller is a freelance writer, designer and strategic consultant who has worked in state and local government.